Obviously there is much to discuss. At the top of my list would be whether or not we’ve been successful in preserving the highest possible levels of editorial quality. Another priority item that’s been glossed over in previous “Chat” sessions: truth-in-hiring. That is … how forthright have we been when describing promotional and financial outlooks to job applicants? Some industry observers have issued alerts that advertisers will be pressing for more favorable editorial exposure in our digital content. This possibility is an obvious sign that church/state disputes are still a regular event. Do you agree? How about freelancer relationships? At one recent ASBPE LinkedIn discussion, anguish was expressed at how some editors were not playing fair with payment policies. Is this process actually within your control or are you laboring under some budgetary mandate? And the list goes on. One promising difference in this year’s event is the level of participation by ethics committee members. You’ll have the chance to seek input from several group editorial directors and two prominent educators. Twitter Chat manager is Paul Heney, former ASBPE president and current TABPI president. In advance of our session, I’d like to receive your suggestions concerning worthwhile agenda additions. You can e-mail me: ethics.chair@editsol.com. Or call (201) 569-7714. I always welcome input from folks on the firing line. And be sure to watch for more updates regarding our final agenda in the Ethics News Updates regularly posted at ASBPE’s LinkedIn site. 5. Whenever possible, the information reported clearly was ground-breaking. Even the smallest magazine staff should plan on publishing a continuous flow of original statistics. So … how do you organize a research effort? How do you exploit it? What are some do’s and don’ts along the way? Here are 14 responses that fill in some of the blanks. 1. If you’re planning a major project, seek input on the questionnaire from your readers. You may be pleasantly surprised to find how responsive people are when you’re not contacting them for the conventional reason of conducting an interview. 2. Follow the established principles of making a questionnaire easy to answer. Have plenty of check-offs and multiple choice, but also include several open-end questions. Also include historical questions; otherwise you lack a frame of reference, especially in terms of sales data. 3. Random sampling is for the birds. Perhaps saying so is heresy to devout researchers. But if you leave things strictly to Nth name response, you run the risk of winding up with lots of non-authoritative responses. 4. Watch questionnaire length. When a questionnaire is especially complex, offer an incentive to respond. 5. Establish a written timetable and stick to it. Allow for second and third mailings. Provide adequate time for your art staff to develop graphics that are easily followed by your readers. 6. Plan on conducting some interviews personally so you can confirm whether the tabulations you are seeing actually make sense. Try to do this early in the game, before the questionnaire is mass-mailed, so you can get the bugs out via some final revisions. 7. Beware of interpreting results based on straight averages. This caveat applies particularly to salary studies. “Median” is the magic word implying proper use. An additional thought about salary studies is to present results by region as opposed to reporting a single national average. 8. You don’t need a high quantitative return if you draw a high quality response. Just remember to say that results reflect only the experience of the sample and are not projectable to your industry’s universe. 9. When you write the article based on survey results, interpret rather than recite. It is absolutely unpalatable for a reader to wade through a series of sentences of the “60% said this, 30% said that, 15% said the other” variety. 10. Proofread your charts and insist on seeing a final color key. For example, the technique of using varying shades of a single color to reflect different response segments can backfire if all those shades appear identical. 11. Don’t be guilty of publishing research that has no foundation. If the overall response is bad, or certain “cell” groups did not furnish adequate data, clearly you are in hot water. 12. Don’t rely totally on the mail. Plan to supplement the response with telephone and/or face-to-face interviews. 13. For best results, always cross-reference your data. There are many significant gems left languishing because hasty decisions were made that cross-tabulation would be too time-consuming. 14. Variety is the spice of editorial research. Depending upon your field and your budget, you can mix trade and consumer projects. One way to get mileage from reader studies is to gather enough information that can be reported in monthly doses without diluting the timeliness factor. In 2010, there were 11.6% more hospital P.T. units than in 2009. In 2011, there were 14.7% more hospital P.T. units than in 2010. Based on this data, is it true or false that the increase reported for 10-11 was 3.1% higher than the increase reported for 09-10? The following facts were reported in a survey of lawncare firms: (1) Of 1,000 firms surveyed, 18% responded; (2) 48% of respondents also provide pest control services; (3) 27% of those offering pest control services consider the business to be unsuccessful; (4) lack of success was attributed to high cost of service by 8% of respondents; dissatisfied customers – 4%; diminishing customer base – 4%. What common statistical problem does the data reflect? Everybody ought to ace this two-question exam. However, be assured that variations of the above snafus do get published from time to time. Numberless pitfall. The interviewer settles for adjectives (“big”…“substantial”…“modest”) as opposed to hard numbers. Sometimes this occurs because the interviewer doesn’t know the right questions to ask. At my former company, we defeated this problem by providing all staff members with a list of two dozen questions that required quantitative answers. Redundant pitfall. In the published article, first the point is paraphrased, after which a quote merely echoes rather than expands upon the point. Transition pitfall. After responding to the specific question posed by the interviewer, the interviewee tacks on a totally unrelated observation that somehow gets published. Jargon pitfall. The interviewee responds in popular terms (such as fashion retailer always talking about “functional” garments) but offers no specific examples. Unclear pitfall. The writer does not understand what the interviewee is saying, but includes the direct quote anyway, assuming the editor or managing editor will catch any snafus. Windbag pitfall. Interviewee offers 500-word, valueless responses to most questions, and an intimidated interviewer makes no attempt to channel response along more useful lines. “For example” pitfall. Interviewee generalizes about specific trends or techniques, and writer does not attempt to ask the “for example” question in pursuit of better information. Hype pitfall. Usually occurs during interviews with advertisers who are trying to get as many self-serving statements as possible into the article. There are many variations on the above, and your recommendations for additions to the list are invited. To avoid posting any low-value quote, of course, you must go the enterprising route by calling the original source (if dealing with a PR release) for better input. Today, however, many editors tell me they don’t always have time to do that. Alas!!! High-benefit headlines always have been a high-priority item for B2B editors. When it comes to digital, having an audience engagement message start right at the top is even more critical. Hot headline is easier to write if lede’s first sentence expresses key story point within first ten words. Bad habit: basing head on first paragraph of PR announcement. There often is better angle further down. Perhaps hot headline you try to write doesn’t work because accompanying article should have been scrapped. News item’s first sentence must tell readers something new. Repeating all or part of the head is not how to do it. Some headline writing suffers from an “echo” that occurs when head and deck sound identical. If few of your articles require heads with numbers, make more assignments designed to fill in the void. Remember that subheads used to break up articles must have all attributes of main head. “Labels” not allowed. Headline variety is helpful attention-getter. Asking questions and pulling hot quotes from articles are two ways to do it. Design that limits main headline length to three or four words is a bummer! Editors must demand more leeway in their turn at bat. Good headlines tell readers what the writer discovered as opposed to what was covered. There is a difference! Of the above items, the one competition entries goof on frequently is #6. This is a somewhat baffling observation, yes? Significant numbers demand reader engagement. Nevertheless, the number of heads including quantitative grabbers rarely exceeds five percent of total. Another caveat not listed above – “cute” – often gets heavy flak when mentioned in a headline critique. Despite being nagged about this in previous competitions, some editors continue to embrace the temptation to engage in clever word play. This is especially self-destructive when the main headline uses three or four words. Surprisingly enough, attempts to be amusing rather than instructive regularly lead off some editorial columns. Instead, accompanying headlines should clearly reflect the author’s opinion. Achieving that goal requires at least eight to ten words. Finally, despite previous blogs and face-to-face exhortations, I’ve been unable to convince some editors to abandon “source first, news last” lede sentences. This snafu’s most common form is beginning the article with a source’s very long title and company affiliation. Before you know it, readers may be dragged through over a dozen word s wondering when the real story starts!! Howard Rauch, ASBPE judge and president of Editorial Solutions, Inc., explains why publishers need to match their enthusiasm to publish a daily e-newsletter with an investment in resources to ensure they are producing a quality product. 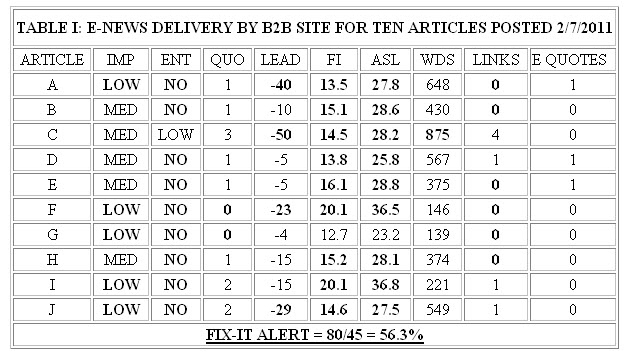 B2B’s plunge into daily e-newsletter delivery seems to be a given. But has the accelerated frequency from weekly to twice weekly (maybe) to daily really been a smart move? Perhaps many publishers caught up in the competitive digital wave have overstepped their limits. This is especially true for those who have not invested sufficiently in the resources (like dedicated digital editors) required to deliver the high-urgency, timely content readers expect. During the past two months, my assignments judging two editorial excellent competitions gave me cause to mull further my current anti-daily sentiments. Being a judge, by the way, is a terrific experience. If you are asked to be contest screener or finalist judge, jump at the chance. One reason why I welcome the opportunity is that it provides a chance to brainstorm with talented entrants about their editorial strategy. (1) Traditional emphasis on breaking news, with anywhere from five to 15 articles per issue. (2) Feature-oriented presentation combining in-depth lead articles with several authoritative blogs contributed by knowledgeable staff and/or recognized industry experts. In the course of judging one category (2) entry, I called the editor in chief for comment. At any time, did his newsletter ever have a heavier focus on news? Answer: Never. Did the current feature-oriented format place his product at a competitive disadvantage with advertisers seeking a newsier format? Answer: No. Hello!!! How many publishers do you think have defied that logic and pushed ahead with daily frequency? Answer: Quite a few, as demonstrated by ongoing e-newsletter studies conducted by Editorial Solutions. Those of you who have read previous blogs may recall that close to two thirds of e-news articles reviewed demonstrated no enterprise. And if a staff can’t demonstrate enterprise with a weekly frequency, why could they meet that challenge once operating as a daily? In a future blog post, I will share several examples of how e-newsletters in judging category (1) and (2) excelled in delivery. But for now, allow me to come at the daily e-newsletter phenomenon from another direction. Recently, in a blog post published on another site serving the publishing industry, a B2B editorial director sought advice from peers on the best approach to launching a daily e-newsletter with a limited staff. Aren’t a lot of us in this boat at one time or another? Perhaps we can make do when starting a weekly e-newsletter. But when speaking of dailies, my advice to the inquiring blogger included a simple caveat: DON’T DO IT!!! If you are currently running a weekly and you and your publisher have been bitten by the daily bug, first try a transitional, twice-weekly delivery. A final thought: Whether your e-newsletter frequency is weekly, daily, or somewhere in between, each issue must include at least one blockbuster, staff-written lead article. Further, at least 80 percent of all articles posted in any given issue should clearly exude a high-impact aura. Conclusion: In many cases, daily B2B e-newsletters have tremendous potential to succeed! But many existing efforts need dramatic upgrading if we wish to prevail in the current highly competitive information marketplace. Your e-news package: If it is broke, fix it! ASBPE’s Ethics Chair Howard Rauch boils bad e-news sites down to the numbers. Some interesting disputes involving creation of original e-news content vs. heavy reliance on the aggregating/curating approach occurred during the past few weeks. My view: The latter approach, while apparently considered the way of the media world, ultimately is not the best practice. On the other hand, that alternative probably is the more convenient way of delivering an informative e-news package. Both approaches do require creative effort. Meanwhile, however, there is a third contingent in the B2B field that continues to plod a non-creative path. This involves heavy emphasis on no-enterprise, straight rewrite of incoming press announcements. In many cases, the approach, as we know, is not a matter of choice. Resources to do a better job simply are not available. The unfortunate result: Too many e-news packages that clearly are broke and do need a lot of fixing. For example, consider the accompanying evaluation from my recently completed Phase II, 50-site e-news study. This ten-article package finished worst of show, accumulating 36.7 out of a possible 100 points. For those of you who missed previous explanations of what the above numbers mean, here’s a quick refresher: IMP = impact; ENT = evidence of enterprise; QUO = number of direct quotes; LEAD = number of words wasted before key story point is reached; FI = Fog Index grade level; ASL = average sentence length; WDS = number of words; LINKS = number of embedded links. The Fix-It Alert (FIA) calculation shows how many items out of the 80 assessed require obvious improvement. This real-life FIA of 56.3% is the lowest I’ve seen out of 100 e-news packages reviewed to date (including Phase I and Phase II studies). Visually speaking, the boldface clusters immediately indicate major delivery shortfalls. Worst execution ratings are earned by enterprise and basic editing skill (the latter reflected by FI and ASL data). Unfortunately the above example is hardly an exception. Only six out the 100 sites managed FIA scores below 20.0%. Another 41 sites earned faltering FIA scores of 40.0 percent or beyond. Clearly, the reason most unacceptable performers don’t feel competitive pressure is because the opposition usually is not much better. The need to raise our quality sites is urgent enough that it will be the lead item in a presentation I’ll deliver at ASBPE’S upcoming ethics webinar this May. We have a terrific slate of speakers on the program. The webinar was postponed this month due to an unexpected angioplasty procedure I had to endure. By May, we will have even more pertinent developments to relay. Hope you can attend! Meanwhile, for additional comment on ethics and other editorial management matters, please follow me on Twitter: www.twitter.com/editsol. In this post ASBPE Ethics Chair, Howard Rauch highlights the importance of making a solid assignment to set the stage for quality content. We all know that the best-written articles begin with a solid assignment from editorial management. The discussion covers all the bases. Best angles are itemized. Sources are identified. The writer comes to the assignment meeting with a list of proposed questions. The list is refined by the assigning editor, after which the information-gathering process begins. Sounds logical . . . right? But when it comes to e-news development, the reality often seems far from the truth. An unhappy ending is guaranteed if the assignee is a new recruit still in the process of learning the industry you cover. Editor-in-chief (EIC) reviews and passes along to staff editor press releases and other source material. Instructions cover placement recommendations regarding channels, resources, recommended research, etc. Additionally, EIC specifies which releases are to be pursued for enterprise reporting. Prior to writing the items, staff editor coordinates with managing editor. This follow-up meeting covers specific subject matter to report, final list of sources and important questions to be posed to interviewees. Staff editor writes the items and sends the file to consultant for analysis and review. Feedback from consultant is conveyed via phone, usually within an hour of receiving the material to evaluate. Staff editor makes revisions as necessary and sends file to managing editor. Managing editor sends final draft to EIC, who pays special attention to headlines and presentation elements. The additional time spent on e-news development has paid immediate dividends in terms of quality. Most important is the dramatic improvement in enterprise reporting and writing pace. Findings of my ongoing e-news studies suggest that this systematic approach to making assignments is non-existent at many sites. For example, my most recent e-news review using eight-factor scoring resulted in the lowest performing delivery to date – 36.5 out of a possible 100 points. All of the articles posted appeared to be straight rewrites of PR announcements. Clearly, whatever assignment process was in place left much to be desired. You may not agree fully with the revised assignment approach described above. But you must have a system in place with quality checks all along the line. Just remember, when it comes to e-news delivery, you are competing with the world, not just other B2B publishers.